Samsung Electronics and LG Electronics have locked horns over wearables, this time after the U.S. release of the two tech giants’ new smartwatches, powered by Google’s new operating system. LG Electronics, which offered a glimpse of its first smartwatch earlier this year, introduced the G Watch at Google’s annual conference on Wednesday. The G Watch, running on Google’s Android Wear, features an “Always-On” 1.65 inch display, which keeps the screen on for 24 hours, and a built-in 400mAh battery. Also, the Google Now voice recognition embedded in the LG smartwatch allows users to search the Web, send messages and check for incoming calls. Fitted with a 1.2 GHz Qualcomm Snapdragon 400 processor, the G Watch is dust- and water-resistant for up to 30 minutes at a depth of 1 meter of water. The product in Black Titan and White Gold, which can be connected to any Android phone, can be purchased for 269,000 won ($264) in South Korea, and $229 in other markets, including the U.S., the U.K. and Japan. Samsung Electronics also unveiled the Gear Live, powered by Android Wear, which is very similar to the company’s other smartwatches in terms of design. The Live weighs 59 grams, compared to the 68 gram Samsung Gear 2. Equipped with a 1.63 inch Super AMOLED display, the water- and dust-resistant Gear Live runs on a 1.2 GHz processor and has a heart monitoring sensor. 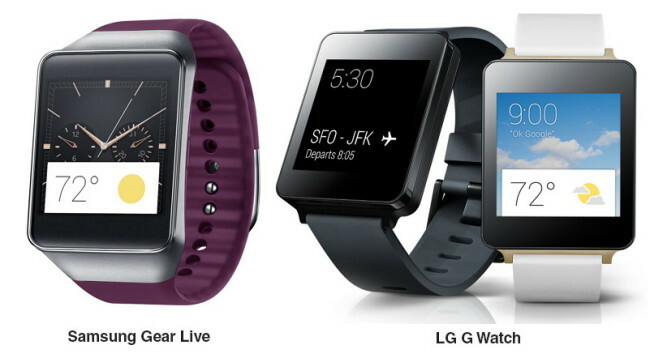 The $199 Gear Live, which is available in Black and Wine Red, also has voice command features, enabling users to search the Internet and send text messages, like the G Watch. “We have successfully incorporated the Android Wear into the Gear Live, thanks to our long-term close collaboration with Google. Samsung and Google will expand the smart wearable market to bring a positive impact to consumers’ lives,” said Shin Jong-kyun, chief executive of Samsung Electronics’ mobile division. The Motorola 360 was also introduced at the conference, featuring a circular watch face, and garnered a great deal of interest from the audience. However, the specifications of the product, which is still in the works, have not been disclosed. Google said that the Motorola 360 will be released later this year. The portal giant added that Android Wear devices will come in a wide variety of fashionable designs with rectangular and circular screens.